Over a week has passed since my wife and I put our first batch of homebrew, Young At Heart Stout, into the hall closet for its fermentation. Within 24 hours, the airlock was merrily bubbling away every five seconds or so. 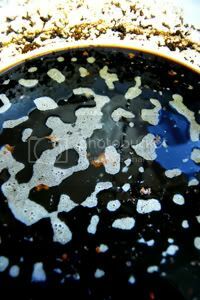 After six days, the bubbles had slowed to a frequency of around 45 seconds. Now, instead of doing what I was supposed to and taking gravity reading each day to see when fermentation bottoms out, I just waited three more days and prepared for bottling. Mistake. To get ready to bottle, the first step was the same as phase one: sanitation. Using our handy bottle washer, we rinsed out all of our bottles. I didn't end up drinking as much New Belgium beer as I had planned to, so we supplemented the 48 NB bottles we had with eight big 16 oz. 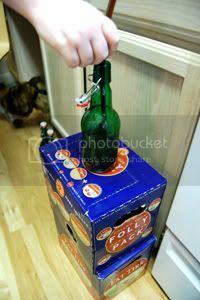 Grolsch pop-top bottles my dad gave me for homebrewing a while back. After rinsing out all of the bottles, we submerged them in the sink (12 or so at a time) with hot water and a splash of bleach. Once the bottles had soaked for around five minutes, we thoroughly rinsed them with the bottle washer again. With all that rinsing, our showers that night, regrettably, were somewhat cold. 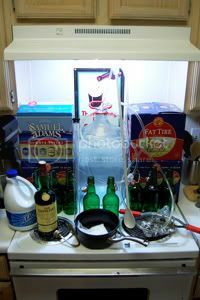 Our next step was to sanitize (once again, with a bleach and water mix) everything else that was going to touch the beer: the carboy, the spoon, the tubing, the wand, the racking cane, the sampler, the hydrometer and the thermometer probe. To sanitize the bottle caps, we simply boiled them for around five minutes. Looking back, we shouldn't have used bleach to sanitize at all, and if we were going to use bleach we should have precisely measured it. Unbeknownst to us, the chlorine in bleach, if not rinsed completely off of equipment, can make the beer taste like band-aids. When siphoning later, I could taste that the beer coming from the tubing was substantially off. I could taste a solid malt background behind the off taste, but it certainly didn't taste like beer. Once everything had been sanitized and rinsed off thoroughly (or so we thought at least), we boiled the corn sugar in one pint of water for five minutes. After the five minutes was up, we opened the fermentation bucket, took quick hydrometer and temperature readings (1.021 at 61°F) and, without thinking, dumped the corn sugar in. After a minute or so, it dawned on us that we had been expecting the final gravity to drop much more. The starting gravity was 1.043 and, based on what we had read, we were hoping for it to drop about 30 points to around 1.013 or so. At this point, we started to worry that the fermentation was incomplete or that something else was very wrong. We don't know what happened. Maybe it wasn't done fermenting. As we didn't take consecutive gravity readings, we'll never know now. Maybe the temperature was too cold for the yeast. The packet said 59°F to 75°F and we were probably in that zone, but definitely on the low side. Maybe we stirred the yeast too vigorously. Maybe we didn't add enough malt or sugar. Maybe we added too much water. Maybe the wort got infected somehow. Maybe we didn't boil the mash long enough. Or maybe our hydrometer readings were inaccurate. It is a mystery. Anyway, the priming sugar was already in the wort, so we decided it was do-or-die. We put the fermenter on the kitchen counter, put the clean carboy on the floor beneath the fermenter, and inserted the racking cane with tubing attached. After washing my mouth with some fine whiskey (my local homebrew shop recommended this step), I started the siphon and let the beer flow into the carboy. We left the last inch or so in the bucket, to keep as much of the sludge out of the carboy as possible. Once the siphoning was complete, we stirred the mix gently to distribute all of the priming sugar evenly and moved the carboy to the counter for bottling. After getting all of our bottles in position we inserted the tubing attached to the bottling wand and started another siphon, noticing that (unexpectedly) there seemed to be some level of carbonation already in the beer. Using the wand, we filled twelve bottles at a time to about one inch from the top giving plenty of room, fearing to much pressure due to the weird gravity reading. Once filled, we capped and boxed the bottles. We're not really all that happy with our capper, as I managed to break the top off of two bottles. While that's not a big percentage, it still seems like enough of a waste to invest in a better capper. With many hours of work behind us, we put the now boxed bottles back in the closet and crossed our fingers. We still have (at least some) hope, so we're going to just walk away for the next two or three weeks and let the bottles condition. Maybe we'll experience a Christmas miracle and Young At Heart will be brilliant. The operating rule in the world of homebrewing is that you always see the process through and only ever throw a batch away if you're sure it's infected. While it's quite possible that it's infected, we have no reason to believe so, so we're seeing this thing all the way through. After all, we certainly didn't expect great beer our first time. This was supposed to be a learning experience, and it certainly turned out to be one (although a somewhat expensive one). And now, once again, we wait... but this time also hope not to be awoken to shattering bottles, Homer "Beer-Baron" Simpson style. Chris, I love it! I can't wait to try some of your beer. So informative. Great post and great blog. I'm thinking of trying to brew my own beer as well. This post will be pretty helpful. 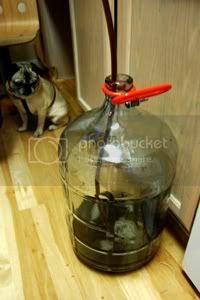 16 glass carboys? How dirty are they?